I have space for one, I have currently a Tron, Woz, JM, Bk2000, LAH, TX Sector, Safe Cracker, Blackhole, Shadow, Star Trek 25th, (may get a Twilight Zone). The one You'll least regret getting rid of. I'd keep WH20. more things to do, more modern rules, still a tough game, dmd animations really add to the atmosphere and it is worth more. 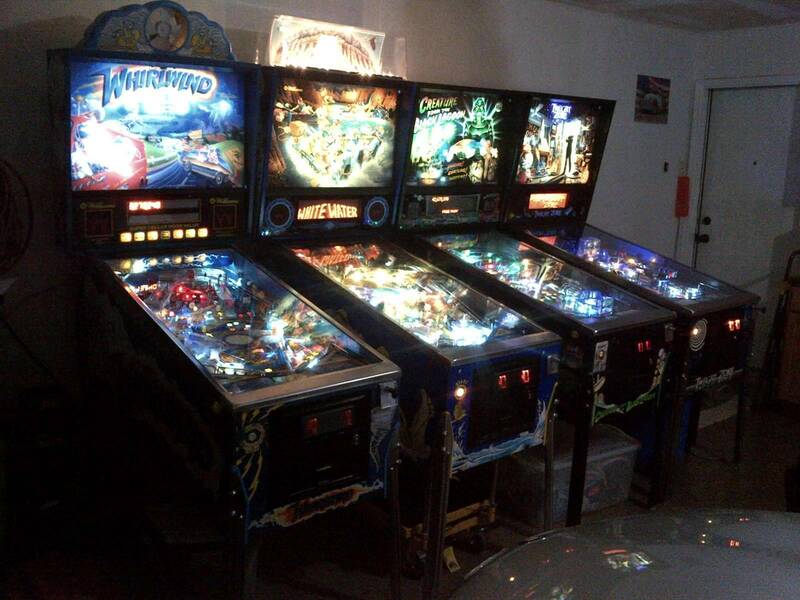 I love both of these games, but Whirlwind is pinball perfection. It would be hard for me to part with for any game. I felt ww was a bit overrated. A nice ww is tougher to find then a nice wh20. I like them both but ww has more staying power. If you lived in my town, I'd say keep Whirlwind. I kept WW, sold WH2O. The abbreviation is easier to type. To me they are equally fun, but WW is much cheaper and has better music and SFX. I had both, but miss WW. I wouldn't get rid of either. White Water is great and is increasingly hard to find in good condition. Whirlwind is an absolute classic, part of one of the best eras in pinball, and really hard to find in decent condition. You'll regret both. You could rent more space. Agreed. There must be something else you are willing to part with!!! Get rid of JM or blackhole. I have both of these games, I consider them bucket list games that will never leave. WW is a sweet game. Move LAH. Keep whirlwind sell WH20 to me! Tough one. I own a WW but would happy exchange it for WH2O, at least temporarily. I have both a WW and a WH2O. I am looking to pare down the collection by 1 game, and neither of those are on the block. I like them both. If I were you, I would get rid of Safecracker. I am babysitting one right now, and it just doesn't do anything for me. The novelty wore off quickly. I have owned both and kept WW. Not even a question in my mind. WH20 moved along in just a few months. I enjoyed Wh20 but Whirlwind is a better overall game. I will play WH20 in the wild but don't miss it. WW is never leaving. The best part is that WW is cheaper. Use the extra cash for another Sys11. It seems that it's harder to advise someone on what to get rid of than it is to recommend buying "Pin A" over "Pin B". But it really comes down to which you like more, not what other people think you should keep for various reasons. Keep White Water. Whirlwind is a good game but there are better Lawlor pins out there. I think that while white water has more initial appeal, that Whrilwind is the better game in the long run. Of course I am biased as WhirlWind is one of my favorites since I played it back in the day. As others have noted it really comes down to your personal preference. Keep WW.....I'd like to own one someday but I have no interest in owning a Wh2o. I mean it has a blowing fan as a topper!!! I can't imagine keeping Black Hole and selling WW. BH and I hated each other! If I had that choice and $ weren't an issue, I'd keep Whirlwind. In the ling run, far more interesting to play. However, as others have noted, I'd get rid of other games in your collection before Whitewater. Wow what a problem to have. I would love either so without owning either if i had them I would keep them. Somewhere down the line I will most likely decide, my problem is room. Keep Whirlwind. Lose something else. A storm is coming, ya wiener! The safe cracker is one I often play for a change of pace. Each Pinball has something that grabs me depending on my mood. Tron, the sound and speed. Woz, the light show, LAH is just an all round brilliant machine and has it all for me. Two machines I regret moving...Dr Who and F14. Sigh I need more space. I would love to...Sold the creature after 5 years, the Jurassic Park, Dr Who, BOP and the list goes on. Have space for 7-10 only at home and then they are friends houses for storage. Interesting to read all the support for WW. My brother has a WW in pristine condition, and, while I enjoy it, I would never pick it over WH20. To each his/her own. I regret selling my Wh20. I still have WW and would never let it go. I would keep both myself. There are plenty of games on your game list I would part with before those two.